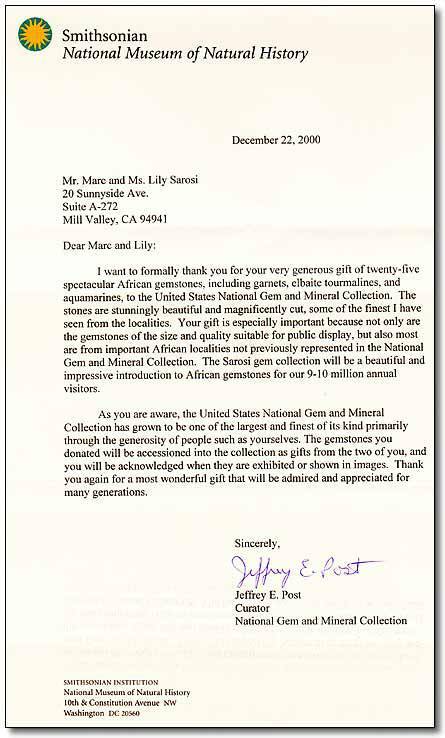 AfricaGems.com is extremely proud of our donation of 25 gemstones to the National Museum of Natural History at the Smithsonian Institution in December of 2000 (see letter). Below are only some of the 25 extraordinary loose gemstones which were donated and are valued at more than $350,000.00! The Sarosi collection will be part of a new African Gemstone collection, which opened in the spring of 2002. We are very proud that these natural gemstones will be part of this world famous institution and will be seen by millions of people for many years. Marc Sarosi of AfricaGems.com has donated many loose gemstones to various charitable causes. Here is a list of just a few. Gemological Institute of America - Marc Sarosi has donated over $ 10,000 in various African gemstones from Africa for research purposes. Just Think � AfricaGems.com contributed an emerald gemstone to an auction event to benefit this very important media literacy organization. Kitumusote � AfricaGems.com donated a pink tourmaline gemstone to an auction to benefit this important organization that helps the Masai people of Tanzania and Kenya. Jewish Federation � AfricaGems.com donated several gemstones to benefit the Ben Gurion Society, an organization for young professional adults. Homeless Prenatal Program � Marc Sarosi donated a gemstone for a silent auction to benefit this great organization. Bay Keeper � Marc Sarosi donated a yellow sapphire to a charity event to benefit this very important environmental organization. Kol Shofar � Marc Sarosi donated a 14 carat Raspberry Tourmaline to this important community organization. Jewish Family and Children Services � AfricaGems.com donated a gemstone to a charity fundraiser event for this vitally important community organization.